Indian Legal Solution is a platform and gate towards the success stories. People around the world face difficulties in acquiring the legal help. As, firstly, it is not always possible to go to lawyers personally and take the legal assistance. Secondly, Lawyers do not have time to look for such small matters and moreover, ‘Fees’ charged by lawyers are not always affordable by people. So here we are there to solve this problem. We are giving you legal assistance online. Our Lawyers from all over India will help you in solving your doubt at a very reasonable charge. They are top lawyers of Supreme Court and High Courts of India. Now you will not need to take out time from your schedule and travel to different places to get the legal assistance. Your money is being saved. You will also not require pre appointments and spend your time in calling the lawyers for a meeting. So, what are you waiting for? 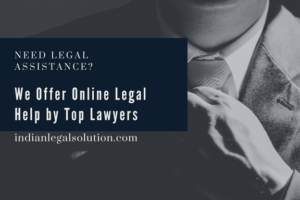 You can easily get legal assistance from home. All you need is to Click Below and Complete Payment Procedure. Our Lawyers will Contact your within 24 Hours. We assure you that you will get fair and desirable results. Happy clients are always our first priority.